The Lagos State Employment Trust Fund (“LSETF” or “the Fund”), was established by The Lagos State Employment Trust Fund Law 2016 to provide financial support to residents of Lagos State, for job, wealth creation and to tackle unemployment. LSETF serves as an instrument to inspire the creative and innovative energies of all Lagos residents and reduce unemployment across the State. (i) Applicants must be between the ages of 18 and35 years with at least a junior secondary school leaving certificate. They must be resident in Lagos State and show evidence of LASSRA ID. (iii) Once your application form has been shortlisted, you will receive an SMS directing you to a VTC for screening. (i) You will have access to a free training program that gives you the opportunity to learn a skill. Address the entrepreneurship capacity gap of the NYSC members who are expected to produce bankable business plans after the three-day capacity building programme. 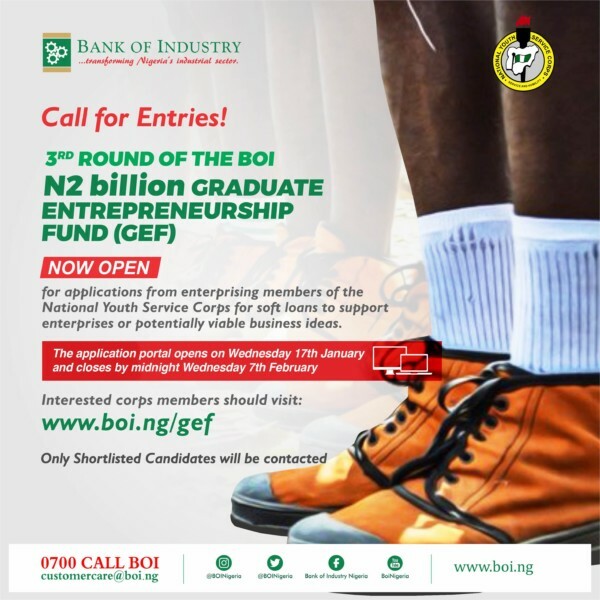 Loan amounts of up to N2.0 million to be provided to each successful participant with bankable business plans within BOI’s 35 SME clusters (list at BOI’s website: boi.ng), at an interest rate of 9% per annum, with tenors ranging from 3-5 years inclusive of 6 – 12 months moratorium period.